Degrowth may be broadly described as an umbrella term that critiques the centrality of economic growth in contemporary societies and embraces various alternatives for ecological sustainability, social justice and human flourishing. As a social movement, it brings together activists, non-governmental organisations, researchers, radical politicians and decision-makers. At grassroots level, care, mutual aid and democratic decision-making are the guiding principles. At the political level, shorter working hours, alternative measures of prosperity instead of GDP, basic income and green tax reform are some of the policies discussed. Research on degrowth may be divided into three interdependent dimensions: ecological-economic critiques of growth, socio-cultural critiques of growth and the search for alternatives (see Kallis et al., 2015). The first two seek to criticise the economic and cultural imperative of growth and highlight its problematic ecological and social consequences. The third presents degrowth itself as an umbrella term for understandings and experiences of good life not tied to growth. A notable feature of degrowth is that it circumvents many of the schisms by which our world is currently divided. Instead of reproducing the split between the natural and the social worlds, it examines them as parts of a whole. This is of crucial importance for studying and finding solutions to the interconnected economic, ecological and social problems our societies are facing. Although degrowth has origins in the global north, it also searches for alliances in the global south. It does not suggest that good life should be confined only to degrowth, but accepts the plurality of understandings of good life found across the globe, as long as ecological sustainability and social justice are at their core. There has been a rising interest in degrowth over the past years. The biennial degrowth conference in Leipzig in 2014 brought together more than 3000 people. ‘Degrowth: A vocabulary for a new era’ – a book that synthesises various themes in research on degrowth – has attracted a lot of attention in the English-speaking world, and translated into ten different languages. 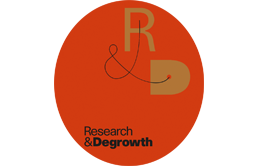 Degrowth is an emerging and a very dynamic theme, and requires continuous multi- and interdisciplinary research. This is what the 6th International Degrowth Conference is intended to contribute to. degrowth-world@lists.riseup.net – mailing list for everyone to share announcements and news related to degrowth. To subscribe, send an e-mail to degrowth-world-subscribe@lists.riseup.net. Then you can send and receive messages to/from the list.